New Jersey the Garden State is regaining its status as a home to many great farms, dairies and now even vineyards. As a kid I remember the many local farm stands all over the state. Over the years these disappeared as New Jersey farmers gave way to sprawling development. This is changing, farmer's markets are coming back. Local daries who are producing wonderful artisanal cheese, something I did not have as a kid, are a part of this renaissance. At the the Montclair Farmer's Market, Walnut Street Station, I found a great New Jersey cheese maker, Valley Shepard Creamery. From the warm and peacefull countryside of the Alt Penedes comes a delicious blend of Cabernet Sauvignon, Merlot and Tempranillo. Loxarel Ops is a wonderful example of the many fabulous "New World" wines coming from Spain. You won't believe it sells for less that $10. My father in law, visiting from Florida found this at Amanti Vino on Church Street in Montclair, after tasting we ran back for more. The restaurant scene in Ridgewood is arguably more happening than Montclair. I have had the pleasure of dining at the fabulous classic French, Latour several weeks ago. Recently dined at Joel's Malibu with friends, Lori and Dave, they love the place and we loved the place. Joel's is a hoot with a very eclectic menu and wild 60's-70's decor. I am looking forward to trying Silver Oak, which everyone I know whose been there raves about, and can't wait to try Radicchio, which I also hear is great. Here is a great gift for Father's Day, weekend guest thank you, or other occasions. 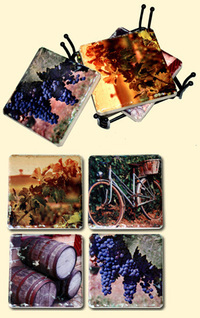 Nothing sets the stage for a vineyard motif quite like these wrought iron coaster sets. The four distinct images combined with tumble stone tile creates a very special decorative flair for wine enthusiasts. The quality of the stone with its shading, nicks, crannies and rounded edges enhances the old world charm. Felt pads protect your furniture from scratches.